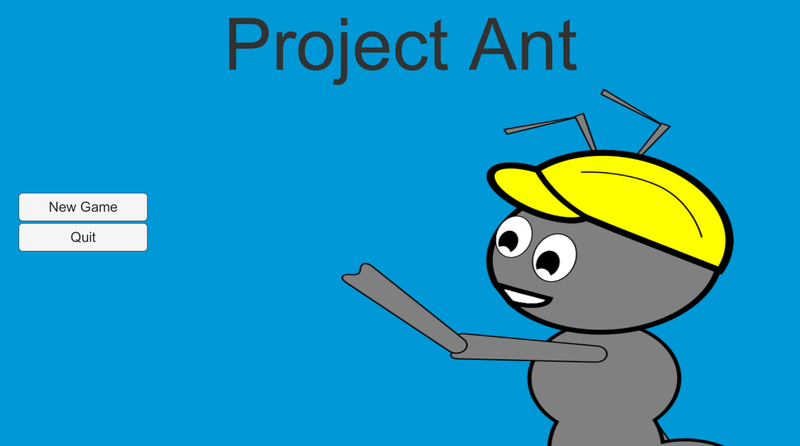 Hello, and welcome to the first official dev update for Project Ant. The other week’s brief introduction doesn’t count. These posts will cover recent progress in the game’s development, and ramblings about game mechanics and interesting (to me) implementation details. If that sounds like your cup of tea, then read on. If not, go and make a cup of tea. It even has a menu now! About a month ago I drew a line under a random set of features and called it v0.1.0. It’s goal was to be something that resembled a working game. There was basic construction, AI, food harvesting, etc, but everything was very rough around the edges. The feedback I received highlighted this roughness, emphasising the need to be adding polish at all stages of development. With that in mind, today I’ve cut a release of v0.2.0 which doesn’t deliver much in terms of new gameplay, but adds some much needed clarity to existing functionality, as well as adding some basic “game” features like a main menu, the ability to pause, and a way to save and load progress. I mentioned before that I provided v0.1.0 to a few friends to test and give feedback on. Unfortunately the response rate was <50%. With that said, I've decided to make a version publicly accessible for all to play as I'll be widening the net for feedback. A live version will be hosted on my site here. This version will be updated occasionally, but not necessarily with every update of the game. It’s also worth noting that it will not be an “officially supported” version of the game. Bugs that exist in the web version that aren’t present in the official versions will not necessarily be fixed.